Traditional Media on A3-Mixed Media Paper. Many thanks to ~Psychotic-Pink and ^Mollinda for Suggestion and Feature! 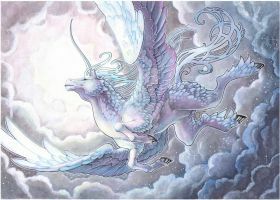 Suggester says: "Everything from the overall feel of the image to the details are stunning." There are so many amazing things about this picture, if i was forced to pick one thing "bad" about it i wouldn't be able too. This is absolutely stunning and beautiful. I have never seen something so amazing before. You well deserved the Daily Deviant and the comments. I really hope you do other drawings just like this. No words can explain the beauty and the effort you put into this. I really hope it has paid off knowing that thousands are looking at it. I find it perfect, i mean i thought this was real untill i clicked it. You amaze me. What you've done here is totally original and deserves all favorites and comments you're getting. I may not seem like a great artist or anything, but i know quality when i see it. And THAT is pure quality. You have earned yourself a watcher. 24 out of 25 deviants thought this was fair. Oh dang, going from the cute version to this intimidating beast is surprising! Its body looks nice at this angle and interestingly sharp ice. my next game (D&D) is featuring alot more aquatic bears because of you. Hope your happy! Hope they won't be too hard to deal with. A good challenge for some mid level characters! Haha, I have to bookmark that! Ask your GM if you can take a scale along, when you fight one? d: For me~? Oh my! First time I see one of these! 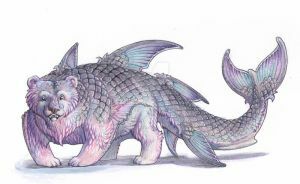 I loved how you blended the fur and scales and fins in a way where they really complement each other, rather than just sticking random fish parts on a bear. Beautiful work! Thanks. ^^ Though be careful what you wish for. hahaha what the hell?! awesome! One of the most awesome concepts I've ever seen! I never thought about something like this before. It is so freaking awesome, wtf. XD Amazing color choices, too. the poles are melting and penguins and the bears have to transform them self into fischy-animals..
Never know, nature has insane amounts of resources when it comes to ideas. And - like it's said - God has humor. Hard to explain the Platibus in any other way. omg, this is so cute. the flow of the colors and textures is very smooth. A cross between a bear and a shark. God help us. God help us all. Outstanding drawing, love the colors and detail! Just incredible. Superschön, Idee, Farben, Details, großartig! lol that's awesome I love all of the scales on the bear and the ice in the water. Und vielen Dank für die Komplimente~!